BOSTON, MA – July 20, 2018 – DPS Group, a privately-owned, global engineering, procurement, construction management and validation (EPCMV) firm serving high-tech process industries, and design affiliate TRIA, a partner-led architecture firm with a focus on science and technology organizations bringing new discoveries to the market, are pleased to announce the completion of a new 200,000 SF Current Good Manufacturing Practices (cGMP) mRNA clinical manufacturing facility for biotechnology company, Moderna Therapeutics. DPS and TRIA provided full architectural, engineering design, and project management services for the new clinical development manufacturing facility located at One Upland Road in Norwood, Mass. The facility’s official opening was marked by a ribbon cutting ceremony held on July 17th. As project architect and engineer of record for this project, DPS provided full engineering design and architecture services for all areas of the facility, including cGMP clinical manufacturing, drug substance suites, formulation, aseptic filling, plasmid production, quality control laboratories, pre-clinical laboratories, toxicology laboratories, and clinical and pre-clinical warehouses. DPS engineers and architects are highly skilled in executing the design of modern, compliant cGMP facilities for the manufacturing of innovative, safe and quality products. 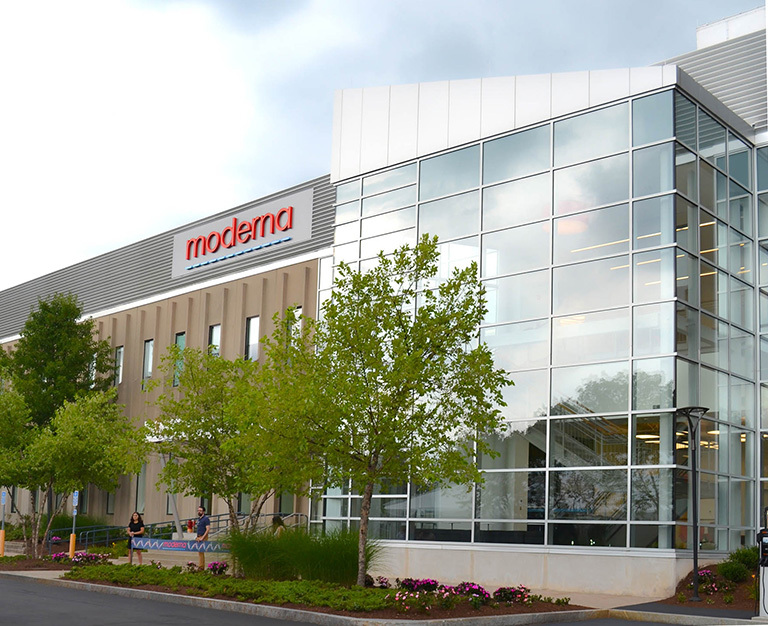 Previously located across three facilities in Cambridge, Mass., Moderna’s new, two-story facility consolidates elements of the company’s development, operations and nearly 200 employees under one roof. Designed and built on a two-year, fast-tracked schedule, the technically complex facility was also designed to achieve LEED certification. The 28-acre suburban campus includes walking paths, electric car charging stations and a fitness center with bike storage. We have grown substantially in recent years and now employ over 1,400 people in our offices and on client sites in Ireland, UK, Netherlands, Belgium, Sweden, Switzerland, Israel, Singapore and the United States. For more information, visit www.dpsgroupglobal.com. TRIA practices the science of architecture. We combine a deep understanding of the unique needs of science-based organizations with decades of experience constructing spaces and places that enable those organizations to meet their goals. Using a principal-driven approach, we partner closely with clients to enable business success and advance new discoveries, in the lab and across the organization. Visit us on the web at https://tria.design and connect with us on Twitter, LinkedIn, and Facebook.